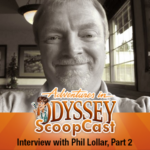 Following on the heels of our last installment, Part 2 of our interview series with Adventures in Odyssey co-creator Phil Lollar is here. 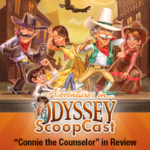 Our ScoopCast interview with Adventures in Odyssey co-creator Phil Lollar continues as he discusses the role of directing episodes of the show and collaborating with the actors in the studio. Also, Phil talks about the special musical episode “Legacy,” Will Ryan, and the Saguaro Sisters.